The C25 is a 48 x 96 mm single loop, compact digital controller featuring multi-range inputs and a PID control system using the new “RationaLOOP PID” (Ra-PID) and “Just-FiTTER” algorithms. Up to 2 control outputs are available depending on model selectable from relay contact, voltage pulse, and current. 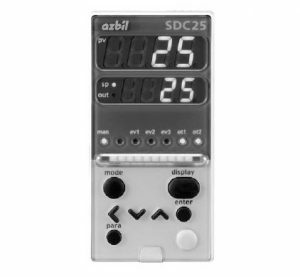 This is a panel mounted controller with high visibility LED readouts and compatible with the Azbil Smart Loader Package which facilitates setup, backup, and monitoring for the entire C15/25/26/35/36 line.